Sara Mohr-Pietsch explores contemporary choral music with guests including composer Sasha Johnson Manning. Birtwistle's The Moth Requiem is Sara's choral classic. 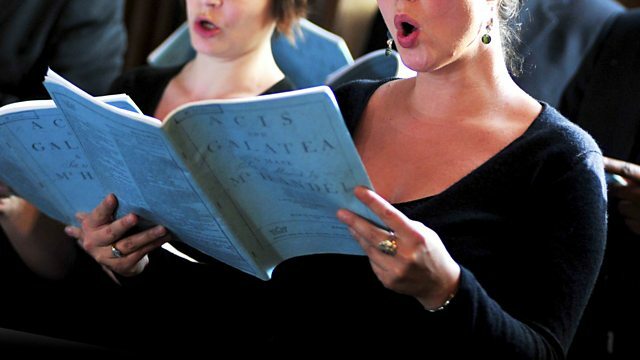 As part of Radio 3's New Year New Music, Sara Mohr-Pietsch explores contemporary choral music including music by Berio, Kerry Andrew, Will Todd, Morten Lauridsen. She is joined by guests composer Sasha Johnson Manning, known for her choral compositions, including Manchester Carols and Requiem and singer John Potter, who's sung anything and everything from early music to the most contemporary avant-garde choral music, with many different groups including the Hilliard Ensemble and Swingle II. The International Chorale of Brussels introduce themselves in our regular spot,"Meet My Choir" and Harrison Birtwistle's "The Moth Requiem", an elegiac piece written for female voices, harps and alto flute, inspired by a poem about a moth trapped inside a piano, is Sara's choral classic. Ensemble: Meredith Monk and Vocal Ensemble. Choir: Manchester Carollers. Orchestra: Northern Chamber Orchestra. Conductor: Richard Tanner. Ensemble: The Swingle Singers. Conductor: Luciano Berio. Choir: Los Angeles Master Chorale. Director: Paul Salamunovich. Choir: Vasari Singers. Conductor: Jeremy Backhouse. Orchestra: Will Todd Ensemble. Choir: St Louis Chamber Chorus. Conductor: Barnes, Philip. Choir: Merton College Oxford Choir. Conductor: Benjamin Nicholas. Conductor: Peter Phillips. Choir: Eesti Filharmoonia Kammerkoor. Conductor: Tõnu Kaljuste. Choir: BBC Singers. Ensemble: Nash Ensemble. Conductor: Nicholas Kok. Choir: Gonville and Caius Coll. Cambridge Choir. Conductor: Geoffrey Webber.